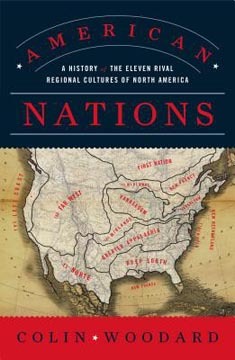 The issues that divide our country are as old as the union itself, according to Colin Woodward, author of American Nations: A History of the Eleven Rival Regional Cultures of North America. The original colonies were founded by vastly different cultures that had little in common, aside from a common enemy during the revolutionary war. Even then there were instigators, pacifists, and colonies that were reluctantly dragged into the fray. One might expect that these disparate cultures would have long ago melded together or been diluted by immigration, but Woodward asserts that the nation is still divided into multiple definable “ethnoregional cultures” that have largely carried forward the beliefs, values, and behaviors descended from the original colonies. These ethnoregional cultures remain intact because new immigrants from other states or countries tend to adopt local perspectives and beliefs over time. In a family, for example, the parents might retain their own traditions, but their descendants tend to adopt the local culture. As a result, the original cultures mostly grew and spread, yet retained identifiable geographic boundaries, independent of state lines, that can be mapped according to factors such as crime rates, religious tendencies, and election results. None of these cultures are able to dominate the national agenda, but through shifting alliances based on overlapping priorities, sometimes one culture can strong-arm the rest of the country into following its agenda. I was drawn to the book because the author outlined a theory of realty that potentially conflicted with the theory of reality outlined in my own book, Roadmap to Reality, and I felt it important to compare the two books. Roadmap to Reality shows how technologies used for survival ultimately dictate population levels, style of government, and beliefs about the nature of reality itself. For example, hunter-gatherer societies typically live in bands that vary in size from a few families to multiple extended families. Hunter-gatherer societies are largely egalitarian, where everyone works to produce food and the chief only has power to the degree that everyone else agrees or disagrees with him. Hunter-gatherer societies tend to have a very magical worldview, believing, for example, that a sacred charm might bring success in hunting. Skipping over horticultural societies to full-blown agricultural societies with livestock driven plows, these societies are overwhelmingly patriarchal and hierarchical, organized as state governments with centralized leadership and standing armies. Agricultural societies typically have a monotheistic and mythical worldview, with a moral code of right and wrong dictated by myths or stories such as the bible. An industrial society enables even larger populations and restores a degree of equality, for example, that men and women can do equal work and attain political power. Industrial societies develop a sequential worldview, for example, that illness might be caused by bacterial infection, rather than God’s will or black magic. Thus, Roadmap to Reality effectively provides a broad “theory of everything” that explains human behavior in all past, present, and emerging societies. American Nations doesn’t contradict Roadmap, but rather compliments it nicely. Roadmap outlines big picture principals that apply to societies everywhere, while American Nations focusses specifically on the ongoing clash between competing ethnoregional cultures largely descended from the original colonies. The culture clashes Woodward describes are deeply rooted in the fact that the southern states were solidly agricultural, while the northern states industrialized first, resulting in vastly different worldviews and beliefs about everything from family life to education to government. Societies do not suddenly jump from one technology and worldview to another, but transition gradually over time. As noted in Roadmap to Reality, northern states were still solidly agricultural in the mid-1800s, driven by a God-given mythical view of reality that dictated right and wrong. Yet, northerners also retained a few holdover ideas from a past magical worldview. They knew and understood that most plants sprouted from seeds, but it was also commonly believed that plants, particularly those that sprouted far from any obvious seed source, arose spontaneously and magically. At the same time, the North was already building textile industries and hand innovated interchangeable parts, laying the foundation for assembly lines and full-scale industrialization in the twentieth century. These technologies are characteristic of sequential, linear thinking. The South has followed the same trajectory, but industrialized later, resulting in a developmental rift and a never-ending culture clash, not just between competing ethnoregions, but between inherently incompatible viewpoints about the nature of reality itself. Roadmap to Reality and American Nations compliment each other to provide a comprehensive view of current events, explaining regional differences that play out in our interpersonal relationships and political dramas. Thomas J. Elpel is the founder of Green University® LLC and the author of Roadmap to Reality: Consciousness, Worldviews, and the Blossoming of Human Spirit and several other books.